I can't find them on census, marriage licenses, and just don't know where else to look. Amanda supposedly lived 102 years, so I even tried to guestimate dates and look for graves. Any suggestions would be much appreciated! I am researching people from the Pennville area who went to California during the Gold Rush, their families, and other people associated with their story. Family names include: Ransom, Jenkins, Anderson, Gibson, Hunt, Liestenfeltz, Lowry, Teach, Jones, and many others. 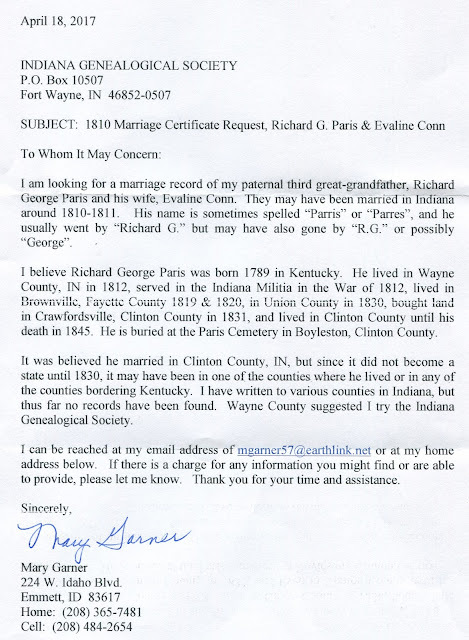 I am seeking out people whose ancestors lived in western Jay County and eastern Blackford County in 1850, even if the name is not listed here. From Delaware County: Swaar, Buckles, Anthony, Sample, Kilgore, March. From Madison County: Makepeace. Looking for Pamela Jean Jones, born February 7, 1950. She was adopted in the 1950’s-early 60’s Her father's name was Preston Jones. I'm not sure, but Elkhart maybe for the county/city. All I know is she also had a brother Preston and a sister Patricia, who were adopted by a different family. Pamela might have had a disability with her legs. Thanks. Need some advice on where to look for one document I need. Am currently trying to enter the Belvidere DAR with a patriot through the Indiana Jackson line. My line goes: Kim Bednar b. 1960 > father, John William Stewart b. 1940 - d. 1990 > Vergil Vern Stewart b. 1910 - d. 1978 > Maggie May Jackson Stewart b. 1881 - d. 1963 > Josephus Jackson b. 1847 - 1918 > William Benjamin Jackson b. 1816 - d. 1872 > Jesse Jackson b. 1782 - d. 1848 & Mary "Polly" Williams Jackson b. 1788 - 1840 > Thomas Swearingen Williams b. 1764 - 1814 > ELISHA WILLIAMS b. 1735 - 1812. The document I need to find is one to prove the father/son connection between Jesse Jackson (1782 - 1848) and his son, William Benjamin Jackson (1816 - 1872). Have looked for a will by Jesse Jackson and have not found it yet. Do you know of any Jackson family specialists in genealogy I could consult? Or do you have any advice on how to find a connection? The Jackson family may have been Quakers at one point, but my line does not appear to be in the records as of that point in time. William B. was born in Miami County, Ohio before they kept records. So I was hoping for any document that would link father and son. Thank you for your taking time to look at my request.